The spike starts very rapidly at 2017-07-11 16:50 exactly. We went from under 30-50 errors per minute to 1000 errors per minute. They're from Jobrunner, which means the counts are in statsd/Graphite, but the errors are only written to stderr (stored in /var/log/mediawiki/jobrunner on the job runners). Fix problem by stopping the job runner from trying to run jobs for the deleted wiki. Index errors from jobrunner.log in Logstash? Once the logs are index, make sure they are included in Scap's our Logstash monitor so that any obvious problems such as these (30x increase) do get detected when deployed, and automatically rolled back. Checking the local logs on one of the servers (mw1303), the error is quite easily found. The last two log files are 1000x bigger (19G instead of 8M). Jul 11 16:53:25 mw1303 jobrunner: <p>Sorry, we were not able to work out what wiki you were trying to view. The problem of ukwikimedia not existing was most likely caused by commit rOMWC30606caf3fb6: Move ukwikimedia to deleted.dblist / https://gerrit.wikimedia.org/r/360564 (@bd808, @demon). Strangely, I can't find anything in the Server Admin Log about the deployment of this patch. Which probably means it was merged without deploying, and then accidentally rolled out as part of preparing 1.30.0-wmf.9 (T167893, @thcipriani). Broadly this looks a whole lot like T87360: Bad LocalRenameUserJob stuck in jobrunner for vewikimedia from 2.5 years ago. There are cleanup steps documented in that task for how we made the jobrunner finally stop spamming the logs about a missing wiki. Per T171371#3462648, it was not until 2017-07-11 16:53 that HTTP requests from jobchron to /rpc/runJobs.php for ukwikimedia started failing. Up to that point, Apache's were presumably still responding to those requests. 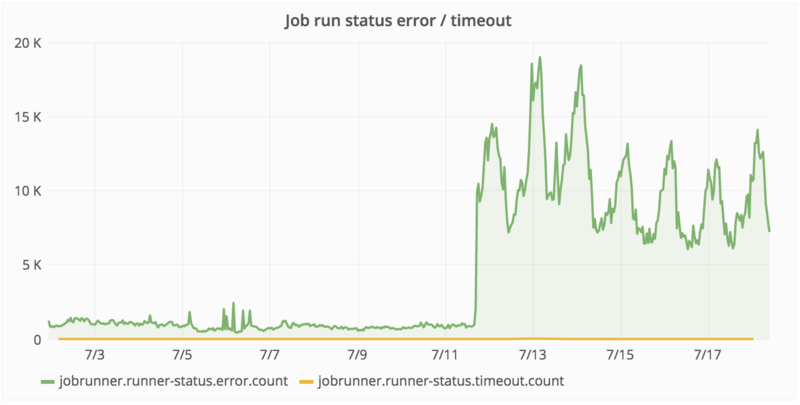 Which suggests that this sync was either a no-op or it didn't apply to job runners, and that something on June 11 did make jobrunners get the latest code. Krinkle moved this task from Inbox to Radar on the Performance-Team board. Krinkle edited projects, added Release-Engineering-Team; removed Patch-For-Review, Operations. I guess this is because JobQueue::delete() doesn't notify the aggregator. Although even if it would, it seems in the case of Redis, this is unsupported as for Redis aggregation, we assume the service (JobChron?) to do it instead. I suppose it's possible for JobChron to manually iterate and aggregate, but it doesn't seem to do that, as otherwise it would've updated the map to remove ukwikimania after I ran wmfManageJobs.php. Did you check redis? Are their jobs back in the queues? It's possible some remote wiki is inserting jobs via JobSpecification or something. Looking at https://github.com/wikimedia/mediawiki-services-jobrunner/blob/master/redisJobRunnerService it throws away the old in-memory map and replaces it with the new one based on global-jobqueue-s-queuesWithJobs-* from each server. There is no persistent version of that JobRunnerService in-memory map. There must be global-jobqueue-s-queuesWithJobs-* keys for the queues anyway. Assuming delete() actually removed them, the only thing that can (rather than remove) global-jobqueue-s-queuesWithJobs-* entries is doPush(). Odd, it's gone from $wgLocalDatabases, so I wonder what is remote enqueueing html update jobs using a different list or DB table (wikidata?). Nice catch. So these must be new jobs then, and this'll help catch where they are coming from. I assume the problem was with the queue deletion script (e.g. maybe the global/aggregator entry persisted). But that would only explain the RPC requests being made, it does not explain wmfManageJobs.php showing a non-empty queue (again). Max and I also noticed backlinks to this wiki from commons in global usage tables. Thanks. I just delete those jobs now. Error rate went from 500-1000/s to 50-80/s. Closing. The two logging-related improvement action item left have their own tasks.